The great outdoors… now available in your living room! Does your cat spend a lot of time inside? Some cats prefer to be indoors while for others, such as apartment kept cats and those with certain medical problems, going outside is not an option. Cat Trees offer a perfect solution for satisfying your cat’s natural instincts in the comfort of her own home, providing your feline a safe place to rest, exercise and play. Keeping the pounds off your cat can be tough, especially if they are prone to weight gain for medical reasons. 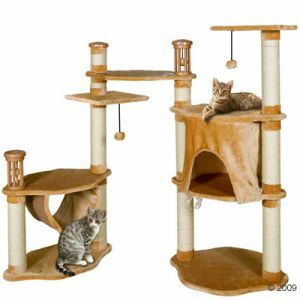 Many Cat Trees feature multiple levels and platforms which will encourage your cat to leap and climb as nature intended. Some also feature hanging play balls – perfect for paw batting! Cat tree pillars double up as scratching posts, providing your cat with a place to sharpen her claws. If your pet is mainly an indoor cat, this basic need may otherwise be met by scratching your furniture! High vantage points and quiet hideaways are particularly important for nervous cats or those who need a place to shelter away from the reach of young children or other pets. Your cat will feel safe and secure in her warm and comfortable new home. The Banana-Leaf Cat Tree Paradise from zooplus is just one of the many cat trees that provide perfect opportunities for lounging and snoozing. The zooplus range of cat trees come in a variety of shapes and designs; we even stock an Outdoor Teflon Cat Tree perfect for a terrace or balcony. You will easily find a Cat Tree or scratching post to suit your home, taste and budget. The Cat Tree Montilla is made up of landing stages at dizzying heights while the impressive Cat Tree Luxor Empire includes a hammock, igloo den, play ball and even a cat nip diffuser! Visit the zooplus shop to learn more about our complete range of Cat Trees and take advantage of some great discounts. Took me time to be able to read most the remarks, however I genuinely appreciated the post. It proved to be Really beneficial to me and I am confident to just about all the commenters here as well! It’s definitely great when you can not only be educated, but also entertained! I’m sure you had fun writing this kind of post. Just want to say your article is stunning. The clarity in your post is simply striking and i can take for granted you are an expert on this field. Well with your permission allow me to grab your rss feed to keep up to date with incoming post. Thanks a million and please keep up the admirable work.